The main base in Belize in San Pedro, will always remain a popular port, as it offers many choices for provisioning and restaurants for dining. The most developed island in Belize, yet people love it for its simplistic approach to tourism – a great place to begin or end any vacation. A laid back fishing village with many choices for less expensive dining. It’s a great stop for a fun night out and is home to several dive shops. Heading south, it offers a last chance to provision. This privately owned island has a fine marina and clubhouse with a pool and caters to the rich & famous. An ideal location if you want to golf on vacation. Armada. 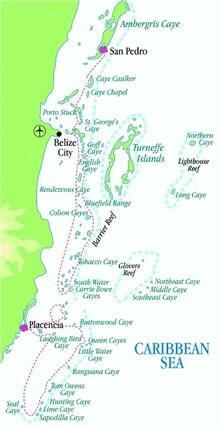 Today it is a cottage colony to wealthy Belize City businessmen. The east side provides a great anchorage behind the sand flats. Dining out is still possible at the only public restaurant, surprisingly called ‘Cottage Colony’. Goff ’s is a tiny island on the reef just north of our main shipping channel, English Channel. 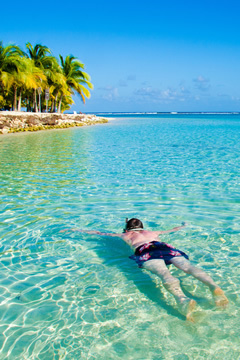 Boasting good snorkeling and a beautiful beach, this tiny caye is made picture perfect by its 15 coconut trees. A lighthouse marks the south side of English Channel, where this island offers superb snorkel-ing 1000 feet south on a huge coral patch. This is a jewel of an island also located right on the reef. Rendezvous Caye is similar to Goff ’s Caye, although it is prettier and less visited. Another beautiful beach with excellent snorkel-ing all around, this is also a good location for scuba diving on the 60 foot outside wall. Not a safe overnight anchorage, however, with it’s coral all around. This is a ‘must see’ day stop. Providing a safe ‘lagoon style’ anchorage, the two fish camps usually offer a choice of fresh seafood for tonight’s dinner. Another safe anchorage with several fish camps, the Colson Cayes offer a shallow lagoon to explore by dinghy, with plenty of coral nearby for snorkeling. A little larger than most islands on the reef this is cottage country for folks from Dangriga on the mainland. A fine overnight anchorage (unless in a norther), you have several choices for basic meals and a few bars on the island. There’s a dive shop for those who enjoy scuba diving and plenty of good snorkeling. Tobacco Caye’s island life is as laid back as it comes. This is as far south as one would go in a week from San Pedro and as far north as you would travel from Placencia in a week. An idyllic retirement island right on the reef South Water Caye is host to three resorts: Blue Marlin Lodge on the north end, IZE (International Zoological Expeditions) in the middle & Pelican Beach Resort on the south end. Here you can usually top up your water tanks, scuba dive, and ... eat drink and be merry! There is also a great beach at the south end for sun seekers. 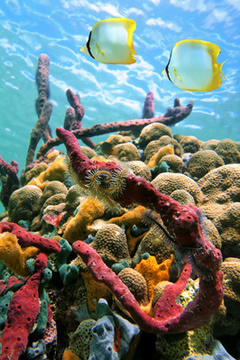 A marine reserve Laughing Bird offers some of the best snorkeling and scuba diving you’ll find inside the barrier reef. 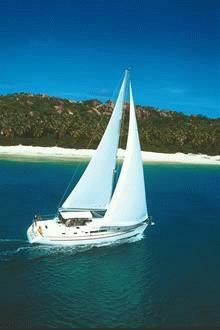 Both cayes offer a fine lee shore for anchoring in any wind. Located quite close to the reef, these three tiny coral islands offer great snorkeling all around and for some a Robinson Crusoe camping experience. Both right on the reef, these islands offer good anchorages for a few boats per night and more superb snorkeling all around. At the south end of the second largest Barrier reef in the world you’ll find a string of palm covered islands that offer enough high ground to build a house or two. Franks Caye has a small resort and Hunting Caye is home to our Belize Maritime Wing who proudly defend our country. Lime Caye is a campground for several fishermen who keep a meal or two available in live traps for your dining pleasure. cottages for the wealthy Guatemalans. Here you are likely to see a 50 foot Hatteras with twin jet skis as well as native Mayas in their dugouts. There are plenty of choices for dinners out and convenient provisioning. The main attraction in Lake Izabal (Guatemala’s largest lake) is a farm on the north shore that offers a restaurant and a hike to another hot spring waterfall, spilling into a cool river of crystal clear water. Well known for their superb diving on the crystal clear drop-off walls of coral, the Bay Islands offer much more than just superior diving. The friendly locals’ English dialect is a pleasure to hear as they share stories of their colorful pirate ancestors, a heritage which they’re quite proud of! Roatan is a long & narrow mountainous island with a paved road from one end to the other. But why drive when you can sail the lee shore? There are plenty of anchorages along the way. You will also appreciate the locals’ laid back approach to life without stress. Guanaja, Cayos Cochinos & Utila are all worth a visit, so plan at least 10 days for this trip. 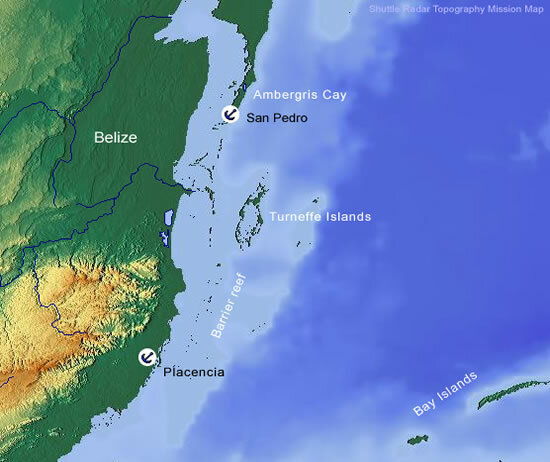 TMM now offers two bases in Belize allowing you to cruise either northern Belize from its base in San Pedro or southern Belize from Placencia. Alternatively, extend your horizons with a one way charter north or south. Considered one of the world’s most spectacular natural habitats, beautiful, ancient and mysterious, Belize always leaves you wanting to return to see more. 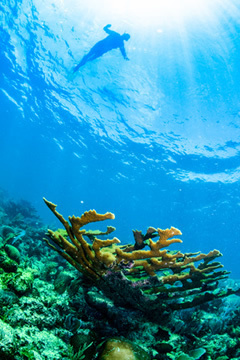 With hundreds of unpopulated cayes, unlimited miles of protected sailing inside the barrier reef, and legendary diving, snorkeling and fishing, it is truly a cruising paradise. Hire a local skipper and sail and dive the three pristine outer atolls (Turneffe, Lighthouse and Glovers), sail to see the Rio Dulce of Guatemala or the breathtaking Bay Islands of Honduras. 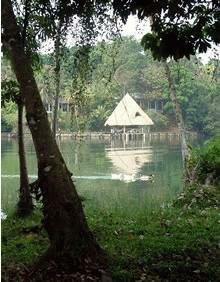 Don’t overlook the many inland options of Belize and Guatemala. Visit the Maya Ruins hidden in rain-forest jungle or float down a lazy river through ancient Maya caves. How about exploring Antigua & Lake Panajachel of Guatemala with majestic volcanoes all around ... and the markets as colorful as the wild macaw parrots?